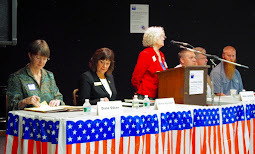 The Honorable Judge Mel Mogen will speak at the League of Women Voters Upper St. Croix Valley's Annual Meeting on April 28th. She won the Burnett County Circuit Judge seat last year and will talk about women in politics. This free event is open to the public. Vote for Vice Chair, Treasurer, and Member at Large.